Would you like to own a piece of Presidential history? Well, Barrett-Jackson is set to auction off a 2009 Ford F-150 King Ranch 4x4 SuperCrew once owned by President George W. Bush. Bush purchased the vehicle in 2009 shortly after leaving the White House. All proceeds from the auction will benefit the Fisher House Foundation, an organization dedicated to helping American military families. The prestigious pickup comes equipped with a 5.4-liter V8 engine, which produces 310 horsepower. 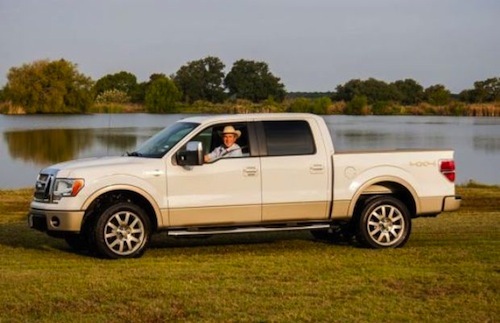 The upscale Ford F-150 also comes with adobe King Ranch premium leather interior and a towing capacity of 11,200 lbs. The pickup also boasts President Bush’s signature on the right airbag panel. Just in case you don't believe President Bush actually autographed the Ford F-150, it comes with a video showing him signing it. President Bush and his wife Laura primarily used the truck to work on their Prairie Chapel Ranch in Crawford, Texas. The former President and First Lady also utilized the truck to entertain friends, family and dignitaries. “I haven’t driven on a street in many, many years, but I have been able to drive this truck on my ranch,” said President Bush. “I want to thank all those who are supporting the Fisher House. In supporting the Fisher House, you’re supporting our veterans. And in supporting our veterans, you’re helping America. This is not the first time Barrett-Jackson has auctioned off a vehicle to benefit the Fisher Foundation. The auction house previously sold a CNN Hummer for $1.25 million in 2007 and Jay Leno’s New Holland Tractor for $535,000 earlier this year. In March, President Lyndon Johnson’s unrestored 1964 Lincoln convertible sold at auction for $46,200. Although Presidential vehicles may appeal to some buyers, the Presidential association does not guarantee a sale. In February, a 2005 Chrysler 300C once leased by President Barack Obama failed to sell on eBay. The auction closed with no bids that met the asking price of $1 million. President Bush’s 2009 Ford F-150 will cross the auction block in Scottsdale, Arizona on January 13, 2013. Wow, he's actually going to pay someone to own it? Very nice. Finally giving back to society... OK, too easy. The good news? It hasn't been worked too hard since GW is afraid of horses, so he avoids going out onto the ranch proper. haha, buahaha. Ya, I miss him being in office. Such an easy target.